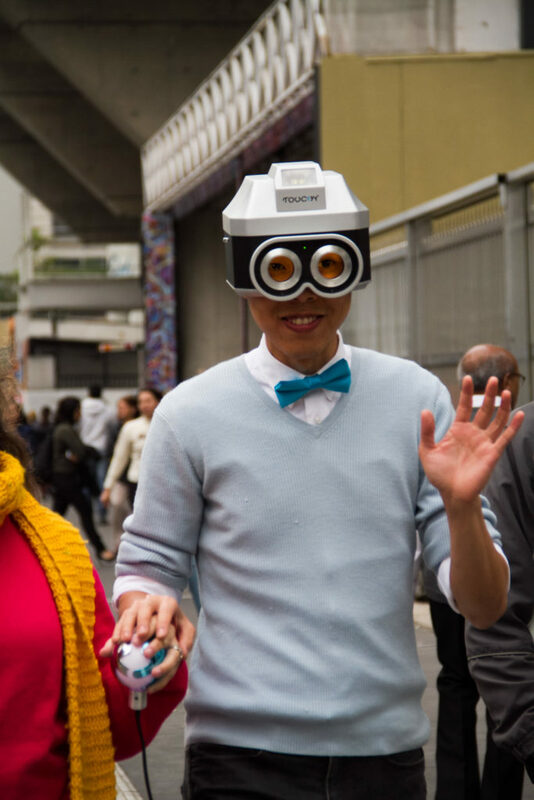 “Touchy” is a human camera – a wearable device that transforms a human being into a functioning camera. The individual who is wearing the device is constantly “blinded” unless someone touches his/her skin. The touch causes the shutters in front of the eyepieces to open and restores the wearer’s vision. When physical contact is maintained for 10 seconds, the camera takes a “Touch-Snap” (i.e., a photo that is taken by Touchy), which is displayed on the device’s LCD. Online social technology loosens our social boundaries, yet equally dehumanizes physical communication. Connecting with people can now solely occur through our fingertips as conveniently as pushing a Facebook “Like” button or posting a birthday wall post. Considering the urgency of such dehumanization, Touchy is devised to encourage offline communication through touch, eye contact and engaging activity of photography presupposing that a camera is historically known for sharing valuable life memories and emotions. The resulting touch-snaps remind us of the ephemeral richness of togetherness. Touchy hybridizes the roles of humans and cameras by unifying their respective capabilities. The mechanical process of taking a photo is transformed into a physical touch and eye contact. With these capabilities, Touchy becomes a magnet for physical communication, potentially turn itself into a social healing device by establishing a reciprocal relationship – the wearer, who is caged in darkness, craves human touch, while “Toucha”, the person who touches Touchy, offers assistance and receives a touch-snap through an effortless touch. The project then investigates the possibility of healing social problems, such as social anxiety, isolated seniors and people with disabilities. Eric Siu is a Hong Kong new media artist who is currently based in Tokyo and works as a creative director. He had received his MFA from the Department of Design Media Arts at UCLA in 2010 after completing a 12-month cultural exchange/research project in the United States funded by the Asian Cultural Council. Eric’s works has exhibited in MOCA Taipei, ZKM, FILE, Transmediale, EMAF, WRO, SIGGRAPH Asia, ISEA, Microwave, and so fort. His work “Touchy” received the first prize from the WRO 2013, 15th International Media Art Biennale, Wroclaw, Poland.